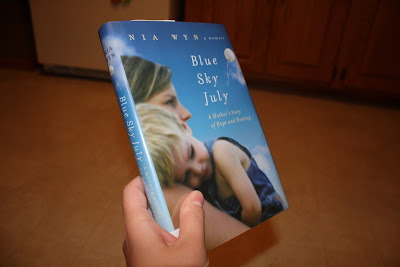 Upon a recommendation from the Kidz Krew, I recently read a memoir entitled Blue Sky July: A Mother's Story of Hope and Healing, by Nia Wyn. Nia's story really resonated with me and I was able to read the book within a couple of days. Her words paint the story of her journey through her son Joe's first seven years (who has severe cerebral palsy), told in a style which is more like poetry than a memoir. Honestly, I've never read anything quite like it. More than anything, it's a story about a mother's love and the lengths a mother will go through to give her child the best life possible. and we are never full. equally beautiful and equally terrifying(pg. 42). So beautifully written. Miracles are all around us and we can't even see them most of the time. Be the one to see them. When it comes to the brain, it's complicated. We don't really know what Elijah experiences. We do know that he doesn't experience his life the same way the rest of us do. It leaves me confused, wishing that I could spend some time inside his little body to better understand how he experiences this world. He can see, but we don't know how much or what or when he's seeing. I'm often amazed at his ability to navigate without running into things. And at other times, I'm amazed at how much he doesn't seem to see at all. He can hear, but we don't know if his brain is processing the information as it should be. He can feel pain, but his brain doesn't seem to know what to do with the information. That leaves Elijah with a seemingly high pain tolerance. Which, by the way, sounds awesome, but it's not. He can process his food, but his digestive system is a lot slower than most of us. Elijah's brain doesn't tell his stomach to empty as fast as it should. He can communicate, but not with speech. It's often in subtle, unconventional ways and you might miss it if you're not paying attention. He can interact with kids, but he doesn't know what to do with them. He often scares them and my heart soars and breaks to watch him trying. You see? It's complicated. Elijah has a lots of can-dos, but they're all complicated by the brain's inability to know what to do with the information, which frustrates me. The brain is always changing, forming different connections. That knowledge gives me hope. But, the brain in it's complicated-ness makes life frustrating. It affects every single aspect of a person's life, from digestion to speech, from mobility to vision to hearing. Every.single.aspect. Whatever you do, protect those little noggins. Because when the brain is hurt - it's complicated. And confusing. And sometimes frustrating. I've found myself telling Elijah "I know you can hear me!" several times in the last week when he's seemingly ignoring me. It's a relief in so many ways - to know that he is indeed getting all the sounds he should be, that he doesn't have yet another thing stacked against him. He doesn't always respond, but it doesn't mean he isn't hearing me. Hearing, listening, and understanding are all different things, of course. 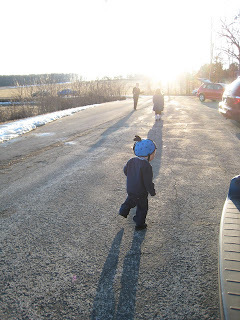 The ABR told us that the information is getting to Elijah's brain stem. What he does with that information once it gets there is any one's guess. 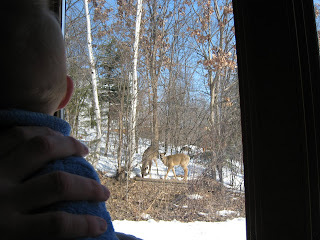 And of course, like any two-year-old, Elijah sometimes seems to have selective listening. Can he understand us? Yes-most definitely. What and how much, though, we're not really sure. In hindsight, I'm glad we did the ABR. It really wasn't as bad as I thought it might be (thanks for the prayers! ), but sedation is still not something we take lightly (especially when the anesthesiologist mentioned that kids with 'developmental differences' sometimes have a harder time waking up). Dealing with a 'drunk' two-year-old isn't exactly my idea of fun. 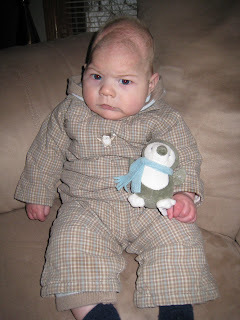 Elijah was wobbly and grumpy for that entire day. But, he can hear and that knowledge is priceless. P.S. Don't the pictures of him during his ABR look like he's just listening to an ipod? Pretty amazing what they can learn with technology these days. Thanks for the prayers and well-wishes everybody! As I write this, Elijah is trying to 'help' me type. That's probably a good indication that he's doing well. I don't have much time, so this'll be quick. Elijah did well with the sedation. He's been pretty irritable and sleepy today, but that's to be expected. The poor guy is pretty wobbly on his feet and requires extra vigilance in keeping my eyes on him. The best news of all - Elijah does not have auditory neuropathy, nor does he seem to have any hearing impairment whatsoever. In the audiologist's words, "I couldn't ask for a better ABR." In order to perform this test, Elijah will need to be sedated. SEDATED. Okay, so sedation completely freaks us out. You see, the one time Elijah was sedated he had some issues with it. I know Elijah was really young at the time and it should be easier this time around, but it's still scary. It's not something we take lightly. And, if I'm going to be completely open and honest with you all, in a lot of ways I know it's going to be psychologically trying for us. It'll bring us back (emotionally) to Eli's NICU days and I don't want to go there. I can hardly even think about watching him passed out tomorrow morning. It makes my heart hurt. Andy and I have gone back and forth several times as to if we were even going to do this test. We've spent a lot of time weighing the pros and cons, discussing it, praying about it. We certainly don't want to put Elijah through a procedure unless it's absolutely necessary. And here's where it gets confusing - we know Elijah can hear. So why, then, would we be doing a hearing test? The thing we're trying to rule out is something called auditory neuropathy. Supposedly, with auditory neuropathy, hearing can come and go, it can be mild to severe, and it could cause a person to have a hard time understanding speech. Basically, it would mean that the brain isn't receiving all of the messages it should be. Considering Elijah's history, it's quite possible that he might have some sort of hearing problems. So, that's how we came to decide to do the test. 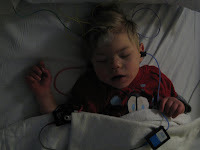 There are possibly things we could do to help Elijah if he indeed had some hearing loss (such as hearing aids or cochlear implants). With that in mind, we are going ahead with the test. We really think it needs to be done to make sure we're doing everything we possibly can be doing for him. We could certainly use some prayers. Prayers for a safe and uneventful sedation experience and for the test to show that Elijah doesn't have auditory neuropathy. Thank you to each and every one of you who care about our little Elijah. It means so much to us. 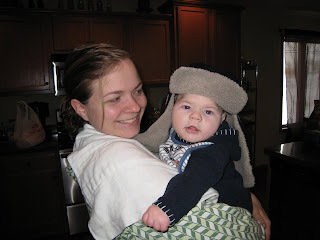 After watching Elijah playing in the snow this week, I got a little nostalgic about his past two winters - his cute hats and snowsuits from days gone by. I decided to take a trip down memory lane via pictures. Care to join me? 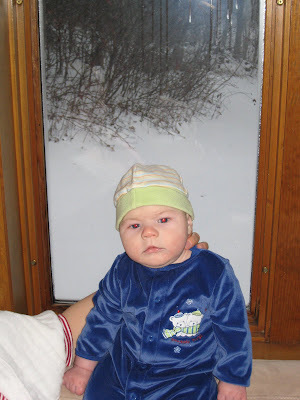 Elijah at three months old, during his first snowfall ever. 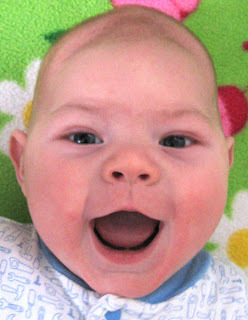 I'm including the smiley photo because he's just so cute. Both photos were taken on the same day - December 1, 2007. I love the smiley boy picture and yet it fills me with sadness to see the deep ridges in his head from his hurt brain. Joy and sadness are so interlocked that sometimes they are carried in the same envelope. But, I digress...back to our regularly scheduled programing. I can't help but wonder...where did that little baby go? Ahhh, nostalgia. When I was a kid, winter was my favorite season. I loved to make snowmen, walk in the woods after a fresh snowfall, build forts and have snowball fights. As the years passed, however, winter became less enjoyable to me. (I think my enjoyment of the season is directly correlated to how much I needed to drive on snow covered roads). 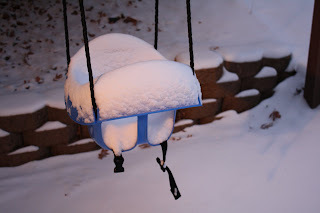 We got our first real snowfall of the season yesterday and today. Thankfully, all of our appointments came to us instead of the other way around. (So today, I'm liking winter). 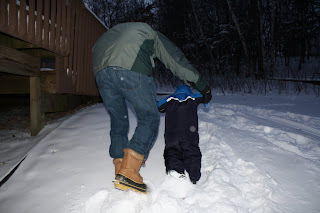 Just before dark, Andy said he was going to take Elijah out to play in the snow. Andy had "commuted" to the basement for work this morning to avoid a long drive to work, so all he had to do to get home was walk upstairs. 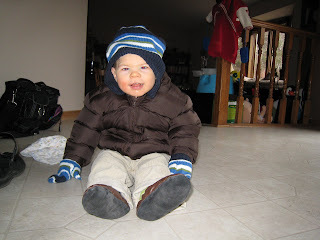 I quickly got Elijah bundled up and followed my two men outside with the camera. 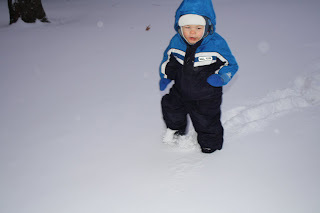 I wanted to capture Elijah's first time playing in the snow. 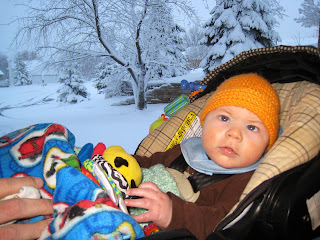 Even though this is Elijah's third winter, it's the first winter he's been mobile and it feels significant. 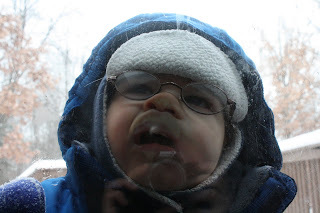 I've been excited to see how Elijah would react to snow this year. 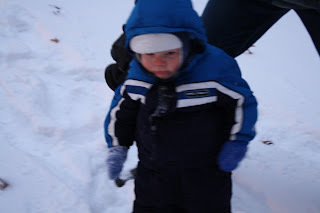 True to his outdoorsmen nature, snow (or cold) doesn't bother Elijah a bit. 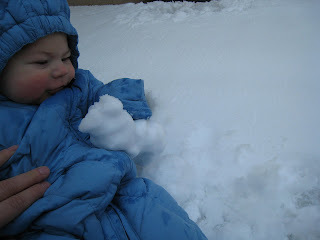 In fact, the little man loves the snow. 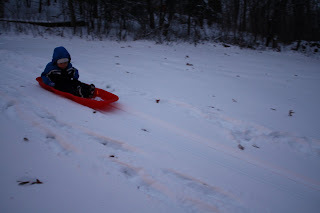 Andy even had Elijah sledding down our little hill (which honestly amazed me that he was able to stay on the sled and maintain a sitting position. Pretty impressive, if you ask me). 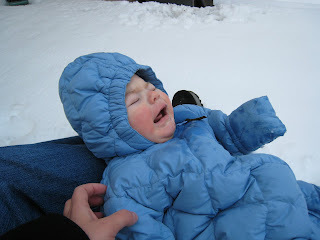 At one point, though, Elijah did fall off of the sled and face planted in the snow. We thought for sure he'd be done with playing outside. He didn't even care much about having the snow in his face. He didn't even cry. He just looked a little annoyed. Soon, it was time to go inside. And Elijah was not happy. Once inside, a major temper tantrum ensued. In Elijah's opinion it wasn't enough time outside. But, Andy and I were cold. And, I'm still a bit of a paranoid parent. 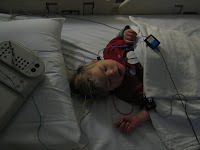 Remember - this is a kid who had temperature regulation issues for quite some time after his birth. I don't think about it much, but the paranoia about him getting too cold lies deep in my soul. Besides, did I mention Andy and I were cold? Elijah must've been too. Especially after his face planting episode. 1- Buy snow pants for Andy and me. 2-Find that little girl who loves the winter. I know she's in there somewhere and I have a feeling we're going to be outside a lot this winter. Might as well decide to love it, right? The hardest thing for Andy and I is to yearn for speech. Something, anything, any words at all, please-just-let-him-talk-to-me speech. It's not that Elijah hasn't said anything. He has. There have been times when I've walked in a room, Elijah has given me direct eye contact and he's said, "Mom." "Yes!" I say, "that's ME! I'm Mom. Mmmmomm, that's right, Elijah, Mmmmooooommm." Most of the time, Elijah doesn't refer to me at all, but once in awhile, I'll hear an "Ahm" and I know he's saying my name. And then nothing. I won't hear it again for a long time. For the most part, Elijah communicates in crying, whining, screeching, laughing, growling, and "dolphin-boy" squealing. He does babble occasionally and if he's feeling really cooperative, he will even mimic some noises (that, however, is exceptionally rare). And then something amazing will happen. These moments are few and far between. I don't really mention them because, well, it doesn't happen very often and I usually chalk them up to my imagination. Flashback to this morning...Elijah has just woken up and Andy brings him into our bedroom. Elijah sees me and leans his body towards me, which indicates his desire to be held by me. 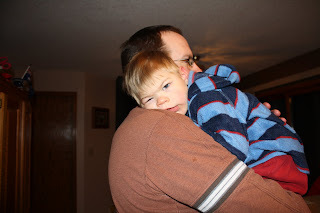 "I love you, Elijah," I say when he's nestled in my arms. And then comes a distinct, "Ahh-vooo." from Elijah. "I heard it," Andy says and we both smile. Our boy said, "I love you" and we know it. This isn't the first time. 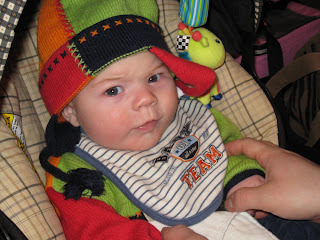 In fact, the first time Elijah said his version of "I love you" he was less than a year old. Andy was saying love you - love you - love you -over and over to Elijah. And Elijah said, "laboo" a couple of times...and then nothing for a really long time. A little over a week ago Elijah said a version of "I love you" to Andy at the dinner table... and now this morning and I'm starting to let myself believe that it's real. Elijah is trying to say, "I love you." It's not like he's never heard it before. The poor kid is probably going to move out when he's a teenager...that's how much he's heard it. He probably won't let me touch him once he's three, I've used up my allotment of hugs and kisses (Nah, there's no such thing as too many hugs or kisses). Let's just say he gets a lot of lovin' (can you really blame us?). If there is one thing I want Elijah to know, it's that we love him...no matter what. He may be a man of few words, but he certainly chose the right ones to say. Because, when I think about Elijah's speech, "I love you," is all I really want to hear and I don't doubt that he is trying to tell us. And let's be honest, he doesn't really need words to tell us how he feels. We know.